STREAMLINE™ your project by ordering your cabinet doors, drawer boxes, components, moldings, accessories, hardware, and finishing from our extensive offering. Choose from a diverse collection of wood, RTF, laminate, veneer, melamine, aluminum, and FSC materials. Enhance your project with our industry leading water-based finishes. This dramatic refacing job transformed the kitchen of this mountain cabin to better fit its home design and natural surroundings. Includes: Revere Solid DF (800D) with OE1 and Revere 5-Piece (800P). Do you come alive in the country? Feel energized by the pulse of the city? Start the journey to your newly designed space by exploring the design style that fits you best. We invite you to learn more about the brands of Decore and see how they can benefit your business. The products shown within each brand can be viewed in their own product sections. The hub of information where you can learn more about specific products, services, and even industry trends. Quick search for articles, FAQ’s or videos. Our new Blog serves as the hub of our news center; look for regular updates with industry news, questions and answers, how-to articles and human interest stories, so stay tuned and check back often. Enhanced Anytime™ Online Ordering … Order – Schedule – Ship! The enhanced AnyTime ordering system fullfills many of the requests from our customers for new features and enhanced flexibility. Some of which include the ability to place orders online, save and come back later to complete an order, view past orders, even view and print current or past invoices. With color images of products, materials and finish swatches and even line-art to help you easily and accurately place your order online. Your session never expires, no matter how long it takes you to complete your order once you start. Come back at any time in the future and your order will still be available for you, in your account and ready to complete. Do you order many of the same items? Then you’re going to love our new Anytime Online Order templates to help speed the ordering process! Cabinet door and drawer box making is a true Cabinetmaker art form. The ability to transform blah, uninspiring kitchen cabinet doors into a homeowner’s dream takes many years of experience, an eye for detail, and the right products and tools. At Decore-ative Specialties we understand that cabinet makers are always striving to do their utmost to please their demanding customers. 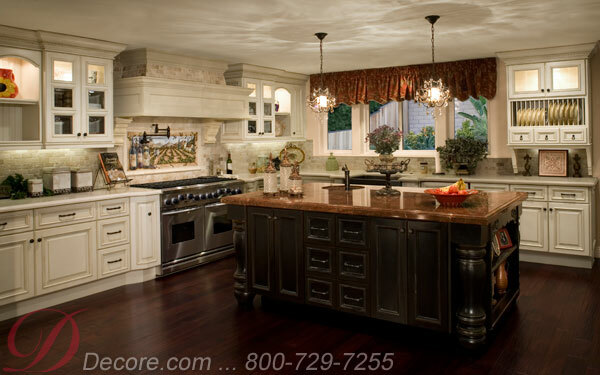 We also understand that it takes a lot of precious time and effort for cabinet makers to keep their customers happy. That is why we have worked hard on our end to design and craft products such as cabinet doors, drawer fronts and drawer boxes that can not only live up to a cabinet maker’s expectations, but also take some of the burden of creation off of their hands. Although we know that cabinet makers typically do their own cabinet door finishing and drawer front finishing, we also know that these jobs can consume a lot of their job time. So we offer our lovingly crafted cabinet doors and drawer fronts in many finished versions, as well as our more traditional unfinished cabinet doors and drawer fronts. By offering cabinet door finishing and drawer front finishing for our cabinet makers, we believe we can help substantially reduce our valuable customer’s work load. You will find that very few other cabinet door manufacturers offer finished cabinet doors and finished drawer fronts for sale. That is because most cabinet door manufacturers do not want to take on the sometimes substantial additional cost of operating a finishing plant. Most other manufacturers also don’t want to deal with all of the rules and regulations that come with operating such a facility, especially in states like California. Yes, we know that it would be far easier for our company to follow suit and to not operate a finishing plant, but we believe that this is a valuable service that many of our customers will appreciate, and so we believe it is worth the added aggravation. Just like you, the professional cabinet maker, we at Decore-ative Specialties realize that this extra step is what a lot of our clients are looking for, and so we strive to please our customers, just as you try to please your customers. Because Decore-ative Specialties has been in business since 1965 and because we are a leader in our industry, we carry all of the materials necessary to create these finished cabinet doors and finished drawer fronts, and we can pride ourselves on being able to craft products that should exactly match your creations. We offer a variety of finishes, including glazes that allow the beauty of the natural wood to peek through, as well as our Elite Choice paint-based finishes that can completely coat the wood. The Elite Choice finishes creates a sleek no grain look that looks especially fantastic in modern kitchens. So matter your customer’s preference, colonial, modern or country chic, we believe that our expert and experienced craftsmen can provide just the right finished cabinet door fronts and finished drawer fronts for your projects. We know you take pride in your work, and so we craft our drawer fronts and cabinet doors to meet your high expectations. Kitchen and bathroom cabinet door remodeling jobs typically require a big investment of time and money from a homeowner, so it is important that the project be done correctly the first time. Unfortunately, too many homeowners have a tendency to get caught up in the short term cost of a remodeling project rather than looking at the long-term benefits of their finished project. As the dollar signs add up, they rashly cut back on items that may seem unnecessary at the time, but could potentially be the difference of whether they will be happy with their kitchen or bathroom or whether they will have to invest in another remodeling project later on down the line. One of the biggest mistakes that homeowners tend to make in terms of bathroom and kitchen cabinet door remodeling projects is to assume that just replacing their current cabinet doors and drawer fronts with new but basic stock versions will be good enough. These homeowners may have already invested more than they expected into counters or appliances and so they then decide that new boring stock cabinetry will have to suffice. Down the road, these very same homeowners may sadly realize that those stock cabinets doors and drawer fronts just look frumpy and out of place in their newly updated kitchen and will kick themselves for not adding the beauty of custom cabinet doors when they had the chance. This is especially unfortunate as cabinet doors and drawer fronts are usually the first things that catch a person’s eye as they enter a room. Sadly, many homeowners aren’t aware that they can get the rich beauty of custom wood cabinet doors for not much more than the cost of generic stock cabinet doors. Because of this reason, it is important that cabinetmakers give their clients an idea of the choices in cabinet doors and drawer fronts that are available to them today. Without some outside guidance, homeowners will frequently only think in terms of the kitchen and bathroom cabinet styles that they were raised with and so may have a hard time envisioning newer or more fashionable styles. For instance, homeowners may not be aware that they can get very detailed and beautiful French Lite cabinet doors and drawer fronts that boast stylist decorative cut-out details in the panels. Glass or other inserts can then be added to the cut out areas for a stunning, sophisticated and one-of-a-kind look. Custom cabinet doors with glass fronts are another beautiful option that really adds refinement and class to any kitchen or bathroom in which they are used. Homes boasting French Lite doors or glass-front cabinet doors and drawer fronts really make a lasting impression on visitors. It is very important for homeowners to choose the right company to create their custom cabinet doors and drawer fronts. An experienced company like Decore-ative Specialties that has been in business since 1965 will not only carry all of the materials and hardware necessary to craft gorgeous custom cabinet doors and drawer fronts, it will also have the talented artisans on hand who can create the cabinet doors and drawer fronts of a homeowner’s dreams. When it comes to intricate pieces such as French Lite doors, it is, of course, even more important that a homeowner’s custom cabinet doors and drawer fronts are made by experienced craftsmen, such as those at Decore-ative Specialties. In the end, investing in custom cabinet doors and drawer fronts is really a no-brainer. These pieces will add refinement and sophistication to your home while you are living in it, and will also add value to your house if or when you ever decide to sell it. Begin the transformation of your current boring kitchen into a beautiful and unique one by choosing specialty kitchen cabinet door and drawer fronts. Because kitchen cabinet doors and drawers make up such a large percentage of your kitchen’s appearance, new models can dramatically and instantly change the appearance of your kitchen. Specialty cabinet door and drawer fronts boast elegant and sophisticated details that will definitely give your kitchen that intangible wow factor that most cookie cutter kitchens lack today. If you are currently thinking about remodeling your kitchen, do consider investing in specialty cabinet doors and drawer fronts over boring stock versions. Here are a few details that you can find in specialty cabinet doors and drawer fronts that you won’t typically find in stock models. Some specialty radius cabinet doors and drawer fronts are manufactured with a subtle curved construction that will give your kitchen a softer, more sensual appeal, as the slightly rounded surfaces will break up all the hard straight lines that are typically found in a house. A cabinet door with a convex radius will curve slightly outward, while one with a concave radius cabinet doors will have a slight inward curve. Both concave and convex style cabinet doors and drawer fronts are beautiful additions to any home and add a touch of sophistication that is so sadly lacking in too many houses today. If you’re looking to create a modern and stunning kitchen, you may want to consider swapping your old kitchen cabinet doors and drawer fronts for ones that boast aluminum frame doors and decorative glass. These specialty cabinet doors and drawer fronts will instantly change your boring kitchen into one that will draw gasps of admiration from visitors. French Lite cabinet doors and drawer fronts are some of the most beautiful ones that you can purchase for your home. These cabinet doors feature multiple cut-out openings in the panels, which are known as lites. Glass inserts or other types of decorative inserts can be then added to your French Lite doors. These sensational-looking cabinet doors will be the envy of all of your friends and neighbors, and they will give your kitchen a very upscale, custom appearance. Kitchens look more open and inviting when they boast cabinet doors that feature glass fronts. Your glass door fronts don’t have to be just clear, either. Today, you can select from such choices as etched, frosted or even colored glass inserts. When looking for specialty cabinet doors and drawers, it is important for you or your cabinet maker or remodeling contractor to work with an experienced cabinet door and drawer front manufacturer, such as Decore-ative Specialties. Not only has this family-owned company been in business since 1965, it also boasts a very large selection of aluminum frame doors, glass inserts, French Lite doors and drawer fronts that you can mix and match to create that special look you’ve desired for your kitchen. In addition, this company’s employees are true artisans. Most have been practicing their craft for many years at Decore-ative Specialties, and they take special pride in turning out a beautiful product. Your home is your palace, your place of refuge and shelter. A true home – and not just a house – should be a reflection of your personality, an extension of who you are and what you love in this world. Unfortunately, too many people live in houses with features they just tolerate, assuming that it would cost too much to change their houses to more suit their tastes and styles. Still other homeowners have watched as wear and tear has robbed their homes of their beauty and wondered if there was anything they could do to renew the appearance of their once lovely rooms. Adding new cabinet doors, drawer boxes and drawer fronts is one way that you can really change or freshen-up the appearance of your rooms, especially your kitchen, bathrooms and closets. Let’s say, for instance, your home currently has bland builder’s cabinet doors and drawer boxes that are functional, but – dare we say – very boring. By changing your old cabinet doors and drawer boxes in, for instance, your kitchen with country style beauties in a rustic knotty alder, this room, the heart of your home, will suddenly have a whole new look and a completely different air about it. If country isn’t your style, then swap out your blah drawer boxes and drawer fronts for ones that have been finished with a sleek colored glaze and high-sheen hardware. This will transform your ordinary kitchen into a modern one that will look like it belongs to a movie star. If you are ready to transform your kitchen or other rooms with new cabinet doors, drawer boxes or drawer fronts, it is important to choose quality products from an experienced manufacturer who has been in business for a number of years. Your new cabinet doors and drawer boxes should feel as good as they look, substantial and not flimsy, and they should be strong enough to withstand years of use. Decore-ative Specialties is the cabinet door and drawer box manufacturer that the finest custom cabinetmakers in America turn to when they need only the best products. This manufacturer, which has been in business since 1965 employs skilled craftsmen and artisans who can create beautiful drawer boxes in every available wood species. Decore-ative Specialties boxes are also available in dovetail and doweled styles. In addition, Decore-ative Specialties can create specialty drawer boxes with such features as scoops, file notching and custom dividers. Its artisans can even engrave your logo into your drawer boxes for that special and elegant personal touch that will show everyone that you have, indeed arrived. Decore-ative Specialties also recognizes the importance of timely delivery of its products, and with five manufacturing facilities located across the United States and its skilled, experienced craftsmen, this family-owned business has what it takes to meet its customer’s needs. Whether you are a homeowner looking for the best products on the market to help transform your house into the stylish home of your dreams or a master cabinetmaker that needs quality items that will make your work stand out, Decore-ative Specialties has the cabinet doors, drawer boxes and drawer fronts you need and deserve. Decisions, decisions, decisions… During a remodeling job, a homeowner has to make what seems like a million decisions, including what style he wants to go with, how much he wants to spend on his project and even such small details as what type of hardware to put on his cabinet doors and drawer boxes. After a while, some homeowners feel like just throwing their hands up in the air when it comes to the smaller details and just have their remodeling contractor or installer have the final say. Although it may be tempting for a homeowner to give up control of these small details to his remodeling contractor, it would be a big mistake for him to do so. Something like the features of a drawer box may not seem important when a homeowner is overwhelmed with making numerous decisions at the same time, but later on when he is spending every day using the item, he may come to regret not having more input into his home’s design and features. As mentioned earlier, drawer boxes can be one of these items that homeowners may not typically put a lot of thought into. When they walk into their kitchen or bathroom, for instance, they just take it for granted that the drawer box will glide open smoothly and then hold their items. Of course, anyone who owns drawers that slide open all on their own or have cracked bottoms know that having poor quality drawer boxes can be a daily aggravation. Because having high quality drawers will save you from this type of aggravation and because beautiful drawer boxes can make or break the look of a home, it’s important to purchase them from a company, such as Decore-ative Specialties, that has years of experience in the cabinet door and drawer box manufacturing business. With Decore-ative Specialties, you know that you will not only be receiving top quality drawers that will last for years, but that your beautiful drawer boxes will exactly match your cabinet doors, as well. Contractors and homeowners will also be delighted to find that Decore-ative Specialties offers a large selection of drawer boxes that are available in every style, including but not limited to Country, Traditional and Modern. In addition, these high-quality drawer boxes are available in doweled versions for those homeowners who need a sturdy, no-nonsense drawer or with dovetail corners that provide extra strength and durability. Customers can also order various features on their boxes, including having them lipped, angled, scooped or Top Edge Finished. Drawer boxes from Decore-ative Specialties can also be ordered with such important details as built-in dividers or even file notching for boxes that are intended for use in a home office. If a customer desires even more flair and distinction, Decore-ative Specialties can engrave its logo on the drawer boxes. Lastly, Decore-ative Specialties can make its beautiful drawer boxes out of any of the available wood species, including such exotic beauties as Ribbon Grain Mahogany or Sapele. With all of these choices, a homeowner or a contractor should have no problem finding exactly the type of drawer box he needs from Decore-ative Specialties. The perfect space for entertaining and relaxing, this kitchen features a timeless Durango door style and a cool, calming color palette. The post Explore Decore-ative Specialties Featured Products Today appeared first on French Lite Door.